Jason Eugene Terry (born September 15, 1977) is an American professional basketball player who last played for the Milwaukee Bucks of the National Basketball Association (NBA). He plays at both guard positions and is nicknamed "the Jet". With the Dallas Mavericks, Terry won the NBA Sixth Man of the Year Award in 2009 and an NBA Championship in 2011. Terry has made the fifth-most three-point field goals in NBA history. Terry attended Franklin High School in Seattle, Washington, where he won back-to-back state championships in 1994 and 1995. On February 2, 2007, Terry's No. 31 was retired by Franklin High School. Terry played college basketball for Arizona from 1995 to 1999. As a sophomore on Arizona's NCAA Championship team, Terry made 18 starts and was the Wildcats' fourth-leading scorer at 10.6 points (also averaged 4.4 assists and 2.5 steals). He was named Pac-10 Player of the Year and was an All-Conference First Team selection as a senior. He concluded his career at Arizona ranked 12th in points (1,461), 5th in assists (493) and 2nd in 3-point field goals (192). Currently, he is the only player in Arizona history to finish with 1,000 career points and 200 career steals. Terry was selected by the Atlanta Hawks with the 10th overall pick in the 1999 NBA draft. In the 2000–01 season, Terry averaged a team and career-high 19.7 points with 3.3 rebounds, 4.9 assists and 1.3 steals. On January 15, 2002, he scored a career-high 46 points against the Dallas Mavericks. On February 28, 2003, he recorded his first career triple-double with 23 points, 10 rebounds and 13 assists against the Chicago Bulls. 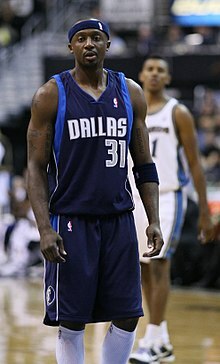 On August 4, 2004, Terry was traded by the Hawks along with Alan Henderson and a future first-round draft pick to the Dallas Mavericks in exchange for Antoine Walker and Tony Delk. Known by his initials JET, mimicking an airplane with his arms as the wings became part of his persona in Dallas. He quickly emerged as a fan favorite despite arriving as the replacement for Steve Nash after the unpopular decision to let Nash leave in free agency. In his first season in Dallas, Terry appeared in a team-high 80 games (started 57 of final 58 games) and averaged 12.4 points, 2.4 rebounds, team-high 5.4 assists and 1.4 steals in 30.0 minutes per game. He joined Steve Nash as the only other player to shoot at least 50% from the floor, 40% from 3-point range and 80% from the foul line. In 80 games during the 2005–06 season, Terry averaged 17.1 points, 2.0 rebounds, team-high 3.8 assists and 1.3 steals in 35.0 minutes per game. He helped the Mavericks reach the 2006 NBA Finals. He had 32 points in 37 minutes in Game 1 against the Miami Heat to become the fifth player to score at least 30 points in his first NBA Finals game, joining Michael Jordan, Shawn Kemp, Tim Duncan and Allen Iverson. In Game 5 of the series, Terry had 35 points. Despite going up 2–0 in the series, the Mavericks lost to Miami in six games. On July 1, 2006, Terry and the Mavericks agreed on a six-year deal believed to be worth more than $50 million. In April 2009, Terry was named the NBA Sixth Man of the Year for the 2008–09 season. A sixth man in 63 of 74 games played in 2008–09, Terry averaged 19.6 points, 2.4 rebounds, 3.4 assists and 1.3 steals in 33.6 minutes. He shot .463 from the field, .366 from beyond the three-point line and .880 from the free throw line. Among NBA leaders, Terry ranked 10th in three-pointers made (167), 11th in free throw percentage, 17th in steals, and tied for 22nd in scoring average. In 2010–11, Terry averaged 15.8 points, 1.9 rebounds, 4.1 assists and 31.1 minutes in 82 games (10 starts). He was the only Maverick to appear in all 82 games in 2010–11. On November 6, 2010, he scored 26 points against the Denver Nuggets. He scored 23 of his 26 points in the 1st half, the most he's recorded in the first half of a game in his career (previous high 22, against the Portland Trail Blazers on April 7, 2007). In the West Conference Semifinals against the Los Angeles Lakers, Terry scored a playoff-high 32 points in Game 4. His 9 3-pointers tied an NBA playoff record held by Rex Chapman, who set it in April 1997 with the Phoenix Suns. The Mavericks went on to advance to the NBA Finals for just the second time in franchise history. In the 2011 NBA Finals, against the Miami Heat, Terry averaged 18.0 points, 2.0 rebounds, 3.2 assists, 1.3 steals and 32.5 minutes over the six games. He recorded 21 points, 4 rebounds and 6 assists in 30 minutes in Game 5 to become the first sub to record at least 20 points and 5 assists in a Finals game since Michael Cooper in 1987. Terry had a game-high 27 points in 34 minutes in the series-clinching Game 6 to claim his first NBA Championship. In the lockout-shortened 2011–12 season, Terry averaged 15.1 points, 2.4 rebounds and 3.6 assists while shooting 37.8% from three-point territory. He finished second in the league with 138 made three-pointers and was third in the NBA in three-point field goal attempts (365). He concluded his time in Dallas with the fourth most three-point shots in NBA history with 1,788, trailing only Ray Allen, Reggie Miller and teammate Jason Kidd. On July 18, 2012, Terry signed a multi-year deal with the Boston Celtics. He averaged 10.1 points, 2.0 rebounds, 2.5 assists and 0.84 steals in 26.9 minutes per game during the 2012–13 season. He recorded his first double-double as a Celtic with 17 points and season-high 11 assists to go along with three steals against the Milwaukee Bucks on December 1, 2012. He scored a season-high 26 points against the Denver Nuggets on February 10, 2013. On June 28, 2013, the day of the NBA draft, the Boston Celtics and Brooklyn Nets reached a deal to trade Terry, Paul Pierce and Kevin Garnett for future first-round picks in the 2014, 2016, and 2018 drafts and Kris Humphries, Gerald Wallace, Kris Joseph, MarShon Brooks, and Keith Bogans. The deal was finalized on July 12, 2013. On February 19, 2014, Terry was traded, along with Reggie Evans, to the Sacramento Kings in exchange for Marcus Thornton. It was later announced that due to a lingering knee injury, Terry wouldn't join the team in 2013–14; instead he rehabilitated the injury in Dallas to prepare for 2014–15. He did not appear in a game for the Kings during his time with the organization. On September 17, 2014, Terry was traded, along with two future second-round picks, to the Houston Rockets in exchange for Alonzo Gee and Scotty Hopson. On December 22, 2014, in a 110–95 win over the Portland Trail Blazers, Terry hit a 3-pointer in the third quarter to become the third player in NBA history to make 2,000 3-pointers, joining Ray Allen and Reggie Miller. On August 24, 2015, Terry re-signed with the Rockets. In July 2016, he parted ways with the Rockets. On August 22, 2016, Terry signed with the Milwaukee Bucks. On February 24, 2017, in Milwaukee's 109–95 loss to the Utah Jazz, Terry became the oldest player to play for the Bucks, at 39 years, 162 days, passing Dale Ellis (39 years, 155 days). On April 10, 2017, he had season highs of 15 points and five 3-pointers in an 89–79 win over the Charlotte Hornets. That was the only time in 74 games in 2016–17 that he finished with 10 points or more. On September 18, 2017, Terry re-signed with the Bucks. On December 5, 2017, he was ruled out for two or more weeks after suffering a left calf strain the previous night against the Boston Celtics. On January 28, 2018, he scored a season-high 12 points in a 110–96 win over the Chicago Bulls. Terry hadn't scored in double figures since his 15-point outing against Charlotte on April 10, 2017. On February 10, 2018, he came off the bench to score 11 points in the second half in the Bucks' 111–104 victory over the Orlando Magic. On February 23, 2018, he had a 14-point effort in a 122–119 overtime win over the Toronto Raptors. On March 2, 2018, in a 103–96 loss to the Indiana Pacers, Terry made his first start since January 22, 2016, with Houston. He blocked three shots for the first time since December 22, 2010, with Dallas against Philadelphia. Terry was a member of the United States squad that competed in the 2001 Goodwill Games in Brisbane, Australia. An elite shooter, Terry has made the fifth-most career three-pointers in NBA history. He frequently pulls up for midrange jump shots off the dribble, and during his time in Dallas, Terry relished the role of fourth-quarter specialist. Terry was one of ten children raised by his mother, Andrea Cheatham, and his father, Curtis Terry. One of his brothers, Curtis, played professional basketball between 2008 and 2012. Terry is the cousin of former NBA player Martell Webster. Terry and his wife, Johnyika, have five daughters. Prior to the Mavericks' 2010–11 championship-winning season, Terry tattooed the Larry O'Brien Championship Trophy on his right biceps. Two years later, prior to the 2012–13 season, Terry tattooed the Celtics' famous leprechaun spinning the trophy on his finger on his left arm. He also got a tattoo related to the Brooklyn Nets in 2013, though it did not reference a championship trophy. ^ a b c MacMahon, Tim (March 22, 2013). "Dirk: Jason Terry deserves ovation". ESPN.com. Retrieved November 28, 2017. ^ a b "NBA & ABA Career Leaders and Records for 3-Pt Field Goals". Basketball-Reference.com. Retrieved November 28, 2017. ^ Ko, Michael (February 3, 2007). "KingCo 4A Boys Roundup | Generation Next leads Franklin past Garfield". SeattleTimes.com. Retrieved March 26, 2014. ^ a b c d e f g h i j k l m "Jason Terry stats, details, videos, and news". NBA.com. Retrieved November 28, 2017. ^ Stein, Marc (July 1, 2006). "Terry, Mavericks quickly agree to six-year deal". ESPN.com. Retrieved November 28, 2017. ^ a b "Mavericks' Terry wins Kia Sixth Man of the Year award". NBA.com. April 24, 2009. Retrieved November 28, 2017. ^ "Jason Terry ties NBA playoff record as Mavs sweep defending champions". ESPN.com. May 8, 2011. Retrieved November 28, 2017. ^ a b "Celtics Sign Jason Terry". NBA.com. July 18, 2012. Retrieved July 18, 2012. ^ "Nets, Celtics work out blockbuster". ESPN.com. June 28, 2013. Retrieved November 29, 2017. ^ "Nets Acquire NBA Champions Kevin Garnett, Paul Pierce and Jason Terry". NBA.com. July 12, 2013. Retrieved July 12, 2013. ^ "KINGS ACQUIRE JASON TERRY AND REGGIE EVANS". NBA.com. February 19, 2014. Retrieved February 19, 2014. ^ Jones, Jason (February 21, 2014). "Malone: Terry will not join Kings this season". sacbee.com. Retrieved November 29, 2017. ^ "Jason Terry out for rest of season for left knee rehab". InsideHoops.com. February 22, 2014. Retrieved February 22, 2014. ^ "Rockets Acquire Jason Terry and 2nd Round Picks". NBA.com. September 17, 2014. Retrieved September 17, 2014. ^ "Harden's 44 lead Rockets over Blazers, 110-95". NBA.com. December 22, 2014. Retrieved November 28, 2017. ^ "Rockets Re-Sign Jason Terry". NBA.com. August 24, 2015. Retrieved August 24, 2015. ^ Yuvan, Darren (July 21, 2016). "Jason Terry will not return to the Rockets next season". thedreamshake.com. Retrieved November 28, 2017. ^ "BUCKS SIGN JASON TERRY". NBA.com. August 22, 2016. Retrieved August 22, 2016. ^ "Hayward, Jazz take charge in lane to beat Bucks 109-95". NBA.com. February 24, 2017. Retrieved February 25, 2017. ^ "Bucks brush past Hornets for 89-79 win". ESPN.com. April 10, 2017. Retrieved April 10, 2017. ^ a b "Antetokounmpo scores 27, Bucks beat Bulls 110-96". ESPN.com. January 28, 2018. Retrieved January 28, 2018. ^ "BUCKS RE-SIGN JASON TERRY". NBA.com. September 18, 2017. Retrieved September 18, 2017. ^ Velazquez, Matt (December 4, 2017). "Jason Terry expected out for multiple weeks with left calf strain". jsonline.com. Retrieved December 6, 2017. ^ "Antetokounpo, Terry lead Bucks over Magic". ESPN.com. February 10, 2018. Retrieved February 10, 2018. ^ "Antetokounmpo scores 26, Bucks beat Raptors 122-119 in OT". ESPN.com. February 23, 2018. Retrieved February 23, 2018. ^ "Oladipo scores 21, Pacers hold on to beat Bucks 103-96". ESPN.com. March 2, 2018. Retrieved March 2, 2018. ^ "2001 Goodwill Games in Brisbane, Australia An Overall Success". goodwillgames.com. August 20, 2001. Archived from the original on November 1, 2001. ^ Ginsburg, Steve (June 10, 2011). "Jason Terry relishing role of fourth-quarter specialist". reuters.com. Retrieved November 29, 2017. ^ "Blazers Present Martell Webster". ESPN.com. June 29, 2005. Retrieved November 29, 2017. ^ "Jason Terry Returns After Baby's Birth". cbslocal.com. December 20, 2014. Retrieved December 21, 2014. ^ Freeman, Eric (May 26, 2011). "Jason Terry got a tattoo of the championship trophy before the season". Yahoo.com. Retrieved November 29, 2017. ^ Dwyer, Kelly (August 13, 2012). "Jason Terry has a new Boston Celtics-themed, NBA championship-assuming, tattoo". Yahoo.com. Retrieved November 29, 2017. ^ Highkin, Sean (September 17, 2013). "Jason Terry is getting a third team-themed tattoo". usatoday.com. Retrieved November 29, 2017. Wikimedia Commons has media related to Jason Terry.